PARKLAND, Fla. -- The father of a student who was killed in the shooting at Marjory Stoneman Douglas High School filed a lawsuit Monday accusing numerous people and entities of enabling the suspected killer, Nikolas Cruz, CBS Miami reports. He laid a large amount of blame for the shooting at the feet of Broward County sheriff's deputy Scot Peterson. 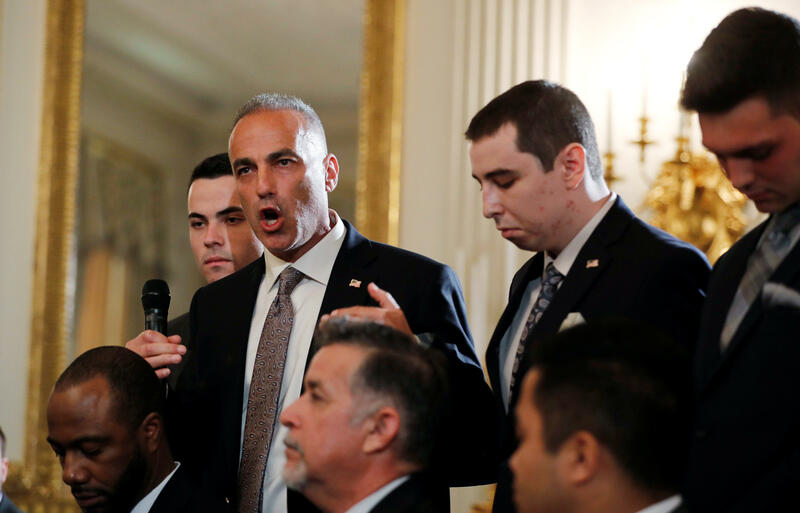 "He could've really saved everyone on that third floor that day," said Andrew Pollack, whose daughter Meadow was shot to death inside the school on Valentine's Day. Surveillance video showed Peterson, who at the time was the school's resource officer, rushing to the freshman building, where he believed the shots were coming from, he told dispatchers. However, the video shows Peterson taking up a position at a building a short distance away and remaining there. "He let my daughter get stalked and shot nine times on the third floor," Pollack told CBS Miami. In the lawsuit, Pollack's lawyers say Peterson, who was armed, hid and failed to confront the threat, endangering the lives of everyone in the freshman building. "Scot Peterson is a coward," the lawsuit says. "Scot Peterson cowered in his safe location … the entire time Nikolas Cruz trained his AR-15 and rained bullets upon the teachers and students…," it continues. Peterson, 54 and a 33-year veteran law enforcement officer, was suspended with pay and then immediately resigned and retired on Feb. 23, when video surveillance footage from the school showed he never entered the building when the gunfire began. Broward Sheriff Scott Israel condemned Peterson's actions, saying he should have gone inside. Peterson pushed back against critics in a statement issued by attorney Joseph DiRuzzo shortly after the shooting. "Allegations that Mr. Peterson was a coward and that his performance, under the circumstances, failed to meet the standards of police officers are patently untrue," the statement said. Pollock's lawyers allege that while Peterson stood outside and called for a lockdown, Cruz made his way to the third floor, shot Meadow Pollack numerous times and then, as she moved to cover a fellow student to try and protect her, Cruz shot her again and again, killing Meadow and the other student. The lawsuit says, "Scot Peterson waited and listened to the din of screams of teachers and students, many of whom were dead or dying, and the blasts of Nikolas Cruz's repeated gunfire." Pollack wants Peterson to pay. "I'm not the type of guy I'm just gonna lay down and this guy's just gonna go collect his pension and go run off into the sunset," he said. "So that's not gonna happen." "When this Peterson moves wherever he wants to move in the rest of the country, wherever he's gonna settle down, anywhere he goes his face is gonna be like a public figure. They're gonna say, 'That's the guy that let those children and teachers get murdered on the third floor.' That's why I'm doing this," he said. Additionally, Pollack said he believes Peterson is responsible for many of the actions of law enforcement officers that day. He believes that because Peterson told people to lock down the school, that impacted the decisions made by deputies and officers. The lawsuit also names 19-year-old shooting suspect Nikolas Cruz; the estate of Cruz's mother, who died in November; and James and Kimberly Snead, the couple who took Cruz in after his mother died. It also names three behavioral and mental health facilities that evaluated Cruz at some point before the shooting, which killed 17 people. The lawsuit details Cruz's troubled life, saying the teen "suffered from severe mental illness and was prone to violence." One part of the lawsuit specifically details a police report filed in February 2016 in which Cruz posted a photo of himself with guns on Instagram stating that he wanted "to shoot up the school."